Kate Davies Blogs! : Going for Broke - Out NOW! Going for Broke - Out NOW! Is it better to play it safe, or go for broke? 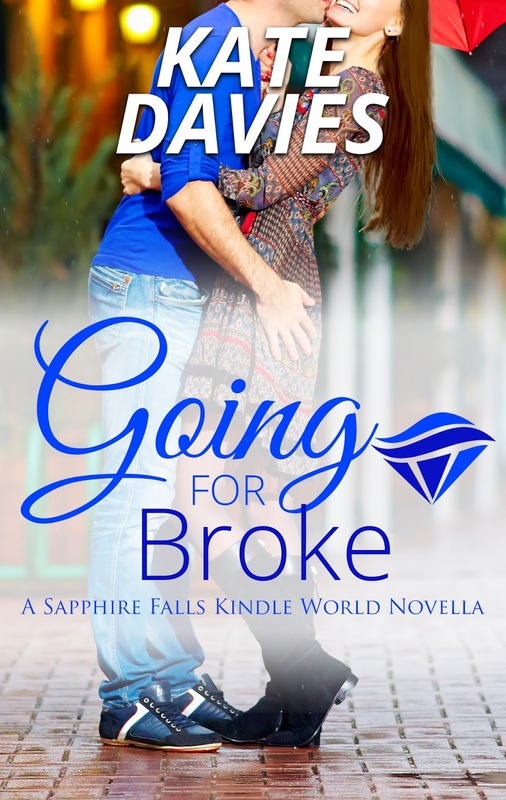 Eleven years ago, Chase Hamilton left Sapphire Falls for the glitz and glamor of Hollywood. Now he's back, and wondering if fame and fortune were meant to be, or even what he wants any more. Especially now that he's reconnecting with his high school scene partner, Mia Gonzales. Mia never really left Sapphire Falls – or the drama program where she spent four years crushing on Chase. Memory of her failed attempt to turn their stage chemistry into a real-life relationship after graduation makes her wary of new pursuits with him. Now he's back, for a little while at least, and hotter than ever. Would a little summer fling be so bad? Available only on Amazon, and only $1.99! Find out what shenanigans this Hollywood actor and small town drama teacher can get up to during the Sapphire Falls festival! 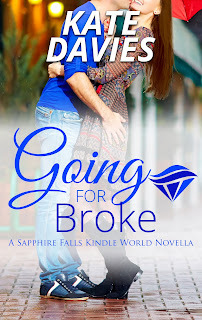 Going For Broke - A Friday Excerpt!